Reading the New York Times’ coverage of the rise of Adolf Hitler and the progress of the Holocaust is a useful and sobering exercise. If you want to understand how atrocities can be normalized, ignored, and downplayed, and how anyone could “not know” facts that should have been obvious to everyone even at the time, browsing through the NYT archives can help. The Times was not the British Daily Mail (which was openly pro-fascist). It was then, as it is now, a liberal paper, owned by a Jewish family. But, partly because liberal naivete about political reality made it harder to perceive threats that socialists and communists saw all too well, and partly because the Times’ owners didn’t want to be seen as being somehow biased toward Jews, the Times was timid about accurately portraying the Nazi menace. [Buried by the Times’ worst failing is] its handling of exactly what people knew and understood in the 1930’s and 40’s as the Nazis drove Jews to their deaths. Concentration camps were nothing new; they’d been around throughout history. Death camps — the Nazis’ contribution to modernity — were unheard of, and the extent of the killing could not have been fathomed… How could Sulzberger or any other newspaper executive have comprehended the extent of what was happening in Europe? That argument is highly plausible, and is often invoked when people or institutions are rebuked for their failures: It’s easy to say now that you should have known, but at the time… The phrase “Monday Morning Quarterback” and the word “ahistorical” are sometimes used. But this argument is not self-proving. It’s reasonable to think it might have been impossible to know. The question is whether it actually was. One reason to doubt it is that the New York Times actually did report on all of the facts that its reviewer said were impossible to comprehend. It just treated them as insignificant. This report, in which every horror of the Holocaust was laid out for the world to witness, was so important that it made it to page 10. The front page that day was devoted to: the Battle of Stalingrad (important, admittedly! ), “EXTORTION CHARGED BY MAYOR IN ROW OVER STIRRUP PUMPS,” “TWO THANKSGIVINGS FOR PACIFIC TROOPS,” and “PRESIDENT WARNS PRODUCTION CHIEFS TO RECONCILE AIMS.” (Out of 23,000 front-page stories between 1939 and 1945, 11,500 were about World War II itself but only 26 were about the Holocaust.) This means that even in 2005, the New York Times was printing fabricated Holocaust history, suggesting that its writers and editors didn’t know about extermination camps, when the obvious truth is that they didn’t care. How does one simply glance past the slaughter of millions? It’s easy: Overlooking the suffering of others is our default setting. People are abused, tormented, and oppressed every day, and while many of us like to think we’d intervene if a crime were occurring before our eyes, when it’s occurring far away, we have an impressive capacity to put it out of mind. The more different and distant other people are from ourselves, the more difficult it is to stimulate empathy for their pain. During the Vietnam and Iraq wars, Americans were far more moved by the suffering inflicted on their own soldiers than Vietnamese and Iraqi families; the Vietnam War Memorial does not list the name of Vietnamese individuals, after all, even though millions of them died as the result of our war. That may seem to make sense, but it only makes sense because of nationalism, and the belief that it’s natural and acceptable to care more about “our” people than theirs. 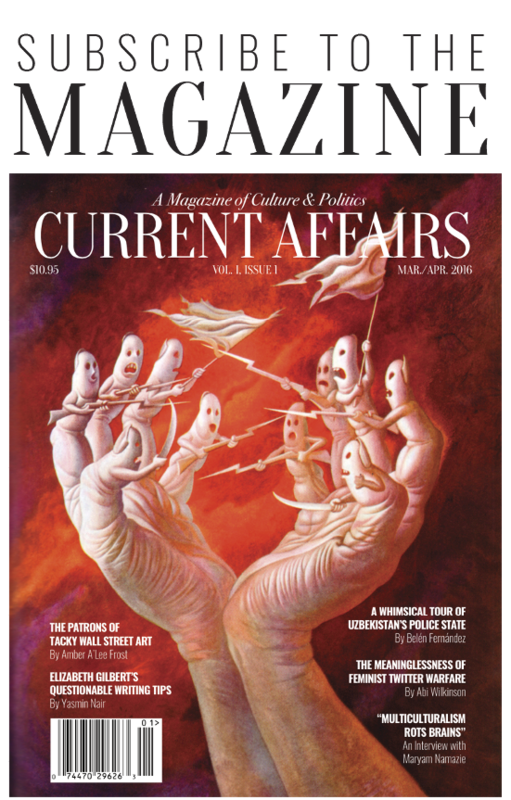 (For more on American indifference to Vietnamese suffering, see my article on the Vietnam War in Issue 12 of Current Affairs.) My colleague Brianna Rennix and I have written about how little attention the American media pays to horrific violence in Mexico, because Mexican lives simply do not matter very much to Americans. You might be fine with that, but it’s an important part of the explanation for why the Holocaust became just another “poor foreigners being killed” story in the back of the paper. 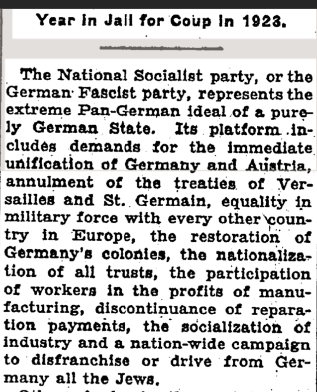 The new party demands that all Germans get together in a Pan-Germany on the basis of the right of self-determination of nations, the abolition of the treaties of Versailles and Saint Germain, colonies for feeding the German people, a sharp fight against the corrupting Parliamentary system, abolition of unemployment subsidies, State participations in the profits of big industries and enterprises, the creation of a healthy middle class, the death penalty for profiteers, the organization of a people’s army, the creation of a ‘German’ press, religious freedom and a fight against the Jewish-Materialistic spirit. Plenty of others from the early-to-mid-1920s are similar. They describe Hitler as the leader of the “Bavarian Fascisti” (at the time, still seen as an offshoot of Italian Fascism) but often mention the murderous hatred of Jews only in passing. 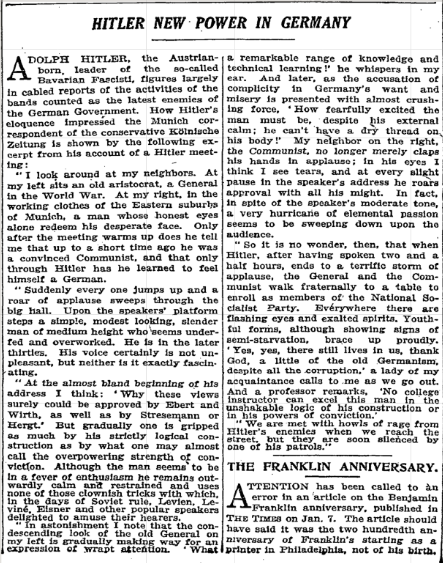 A short article from 1924, after the Beer Hall Putsch, is called “Hitler Writes Book While In A Prison Cell,” and while it quotes an admirer promising that Hitler “will someday be reckoned among the greatest of his people,” and notes Hitler’s claim that he saved Germany from dictatorship, it says nothing about Hitler’s ideology other than that he “will soon be added to the list of political prisoners who have used their prison term to write books.” Another 1924 article, “Hitler’s Headquarters Are Described By Visitor,” is similarly focused on procedural aspects without interest in the ideological or programmatic substance. Many focus on issues we’d today call “horse race politics”: How are the fascists doing politically? Are they succeeding? Are they failing? Who are their central figures? What do people think of them? Those questions seem reasonable and important, but if they’re not paired with a strong moral sensibility, then one can lose sight of the actual human stakes of the political questions. Hitler sometimes takes a nap, or at any rate retires for a quiet hour of reading or thinking by himself. However, nap or no nap, the Fuhrer leaves his guests and everyday entourage to amuse themselves after their own fashion… [AFTER THIS THERE IS A LONG PART ABOUT HITLER’S TEA PAVILLION]… Hitler can be a good listener and seems to gather a good deal by letting American solo dancers or German film stars talk to him. 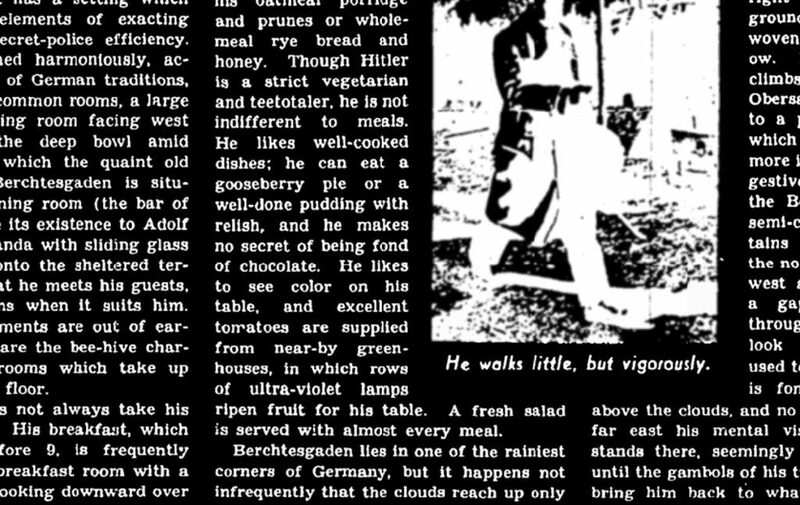 A few notable tendencies recur in Times coverage of Hitler during the 1920s and ’30s. It’s not that the actual facts aren’t reported: Almost all of them are there, somewhere in the paper’s pages. It’s that the presentation and emphasis is strange. For example, when Kristallnacht occurred, it made the front page, but the headline was strange: “BERLIN RAIDS REPLY TO DEATH OF ENVOY.” The subheadline was “Nazis Loot Jews’ Shops, Burn City’s Biggest Synagogue To Avenge Paris Embassy Aide.” (“Reply” is a very odd word to choose.) Or look at the way the Times presented the news that 5,000 people had been imprisoned at Dachau in 1933: “Interned men have no complaint of treatment—those who ‘behave’ to be freed after a month.” The body text quoted, without skepticism, the Nazi claim that some prisoners “will be released on probation after a month.” Here, we see another press tendency that persists to this day: printing government claims as fact, even though we know from experience that governments constantly tell lies. We can, of course, say that these stories only look ridiculous in hindsight, now that we know the course of history. But the threat Hitler posed to Jews was never hidden. It was in our papers, but people didn’t look, and didn’t protest when the United States government turned Jewish refugees back to face their fate. More importantly though is the “fool me once” element: The people who penned these newspaper articles, and the people who read them, are almost all dead. I am not interested in blaming them, or even criticizing the New York Times in particular. I’m interested in pointing out what the moral failures of a prior era can tell us about how we should act in our own time, and what our blind spots might be. For me, the central lesson in reading the Times’ coverage is that it’s very easy not to notice that you’re overlooking something horrendous, that your biases and lack of curiosity are keeping you from appreciating things as they actually are. And because this is the case, we always have a duty to investigate the world closely in order to find out whether we may be just as delusional as people from prior eras. The New York Times did not fail to cover the Holocaust adequately because the Holocaust was so “unfathomable” that it was impossible to believe. They failed to cover it because they weren’t concerned enough about the lives of European Jews. Auschwitz was buried next to the classifieds, because the liquidation of millions of disenfranchised minorities in a far-off country was not something people cared about or wanted to hear about. That’s the same reason they could print articles about Hitler that didn’t mention his ideas: They didn’t really think much about his ideas, they were more interested in process than substance, because they didn’t work through the implications of what he was saying, or the potential consequences for other human beings. I don’t mean to analyze everything through the lens of the “left-liberal divide.” But the Socialists and Communists who protested Hitler in the early days and were beaten up by Brownshirts were under no illusions about what fascism was. And while you don’t need to be a socialist to see threats in the making, you do need to have a clear moral understanding of the world, and a willingness to label things what they are, rather than feigning objectivity and declining to use divisive and alienating language for fear you will look biased. When it comes again, as it very well might, it will not look exactly like it did before. There won’t necessarily be swastikas, and there probably won’t be any goose-stepping. The victims are not likely to be the same; we are now, thank God, sensitive to anti-Semitism and its risks. The question, then, is what we aren’t sensitive to. What won’t we notice until it’s too late? What could get worse and worse, without clearly registering in many people’s minds as an atrocity? Which groups receive the least empathy? In our time, I am especially concerned by the way that “legal status” is used as a proxy for “being a full human person,” since laws themselves are only as humane as the people who happen to be writing and enforcing them. Obsessing over “legality” is very dangerous; as one protest sign I saw pointed out, the people who hid Anne Frank were breaking the law, while the people who killed her were following it. I can envision a world in which “noncitizens” become nonpersons, and nobody notices what happens to nonpersons because nobody sympathizes with those who do not follow the law. If you didn’t want this to be done to you, you should have obeyed. We are not in a time resembling 1920s Germany just yet. Hopefully, we will never be again. But if we ever are, a “never again” mentality means understanding how atrocities can be normalized, how moral blind spots can cause us to overlook terrible suffering, and how real objectivity does not just require a sense of superficial balance, but a deep understanding of what matters. The past is frozen in amber. We can’t go back and scream at those who were willfully blind to obvious crimes. But what we can do is try to look at our own era as we look at theirs, to think about what we’ll look like in retrospect, and to try to do what we wish those others would have done. And we can ask if future historians are looking at us across time, pleading with us and asking a question for which we have no good answer: Why didn’t you stop it before it started? Why did you wait until it was too late?